Got this promo codes from the official Talk N Text website, compiled all working text and unli text promos with photos to easily share it to your friends. 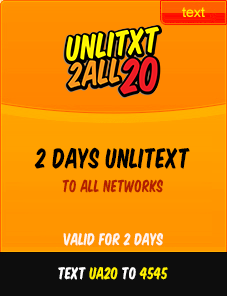 The new text promos are good for 1 day to 30 days, text to SMART/TNT or to all networks, we also have promo that is cheap but full of features. Choose the right TNT text promo that best suit your needs. 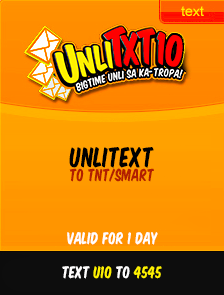 U10 or UnliTXT10 - 1 day unlimited text to Talk N Text and SMART subscribers, to register just text U10 and send to 4545, you can also load via retailers without using the code, valid for 1 day for only P10. 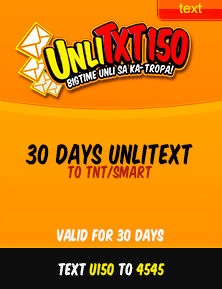 U150 or UnliTXT150- Enjoy unlimited text to TNT/SMART subscribers that is valid for 1 month or 30 days, to register is simple, just key-in U150 send to 4545, alternatively you can top-up through local SMART dealers for only P150 per month. 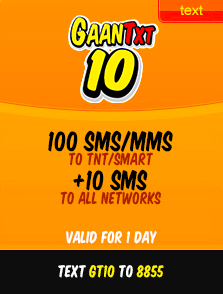 GT10 or GaanTXT10 - A promo with text combo to SMART/TNT and free 10 texts to all networks, one of the best Talk N Text text promo, to register text GT10 and send to 8855, can be use for 1 day for just P10 per registration. 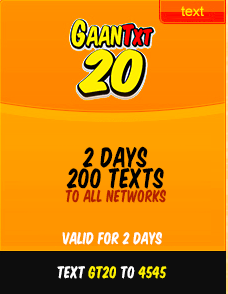 GT20 or GaanTXT20 - A text promo that gives 200 texts to all networks, it is pretty useful since it can be use to text Globe/TM as well. Will expire in 2 days after registration, to register just text GT20 to 4545 or look for the nearest load retailers near you. Amount is only P20. STEX15 or SangKATUTEX15 - A promo that has 200 texts to Talk N Text and SMART subscribers, valid for 2 days for only P15, to register just text STEX15 to 4545. This promo is a good alternative to GT20, since its only 15 pesos but the downside here is limitation of network you can text. 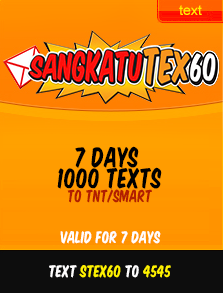 STEX60 or SANGKATUTEX60 - This promo is best for long term texting, 1000 text to TNT and SMART buddies is quite enough for 7 days, registration is easy just type to your phone STEX60 and send to 4545 or load via load retailers, by the way only available to TNT subscribers. The list are the best text promos so far from Talk N Text. What I like about Talk N Text is that they constantly creating promos that is affordable and easy to remember promo codes. you promo is not workin, base on my personal usage , after texting 2 to 3 hrs , advise will notify , your load is nearly end , after 4 to 5 hrs text messaging stops no more ulitext happen for 2 days , on ua20 sent to 4545, so stop fooling and stooling hard earn money.